A Call to Action is a clickable message, image, or HTML script that appears anywhere in your video, and it lets your viewers know what you want them to do next. 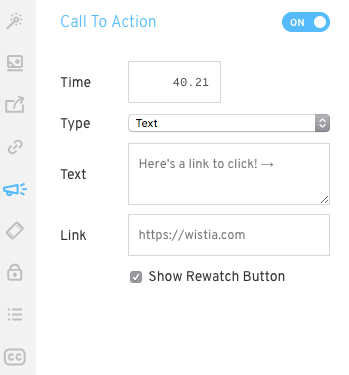 Text: add a quick, customizable message that links to direct your viewers. Image: use an image instead of a text link to direct viewers. HTML: write your own custom Call To Action. When adding your link, make sure you include the http:// or https://. You can build a custom HTML Call to Action that takes on-page or inline styles. Where possible, use on-page styles (i.e. including them in a <style> tag in the head of your page), because they may be stripped out during the customization process. Since HTML Calls to Action allow for advanced customizations (which could lead viewers away from our stats servers), they won’t collect any Action stats. Why Can’t I Remove the Skip Button on a CTA? The logic behind disabling the Skip option is due mostly to the nature of a Call to Action. Since it can appear anywhere in the video it’s sort of fruitless for it to not be skippable, since it blocks the rest of the content from being visible. There’s really no point in having anything after a CTA if someone can’t skip it. The viewer is sort of just stuck there. For this reason, we’ve made it so that the viewer will always be able to skip a Call to Action. The button will become a Rewatch button if the CTA is placed at the end of the video.